Duranodic integral color anodizing discontinued SAF – Southern Aluminum Finishing Co, Inc.
Integral Color Anodizing – Discontinued by SAF. Alcoa introduced and licensed their proprietary, trademarked Duranodic Integral Color Anodizing process in the early 1960’s. 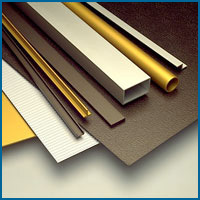 Today, there are many kinds of anodized finishing options for both Aluminum Sheet & Aluminum Extrusions. In the early 1970’s the 2-step Anodizing process was introduced as an alternative. Subsequently, Alcoa lost interest in this market presumably because of the increased competition. Their Duranodic process became known as “integral color.” Integral color simply means the coloring and anodizing takes place in a single step. With 2-step Anodizing the aluminum is first sulfuric acid anodized and then electrolytically impregnated with tin salts. At SAF, we perform the 2-step Anodizing process. For differences between the two process, click here. Southern Aluminum Finishing only offers 2-Step Anodizing and no longer offers Duranodic anodizing.